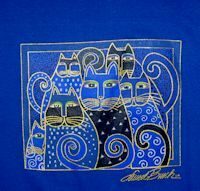 This royal blue Laurel Burch cat t shirt goes perfectly with jeans. It is made of 100% pre-shrunk cotton for softness. It has a rounded neck, tailored short sleeves and a redesigned cut for a better fit. Design comes in S (bust 34" - 35.5") only.